An uncoordinated and mismatched Christmas lights display will make any festive holiday yard hope for better. When planning to buy Christmas lights for a special yard display, keep in mind basic principles of art and design: unity, variety, balance, contrast, proportion, and pattern. Buy Christmas lights with attention to unity. Make all yard decorations coordinate to tell one story/theme. An example would be a monochromatic white lights display illuminating trees, shrubs, house, doorways, wreaths, and special decorations. 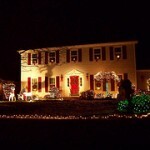 A second design principle to consider when setting out to buy Christmas lights is variety. Variety is important to emphasize visual diversity emphasizing different forms and types. A key factor to keep in mind is to use the same type of light throughout the entire display but use different types of light displays including tree lighting, shrub lighting, wreath lighting, outlining walkways, outlining buildings, and novelty lighting. Balance is another important consideration when intending to buy Christmas lights. A Christmas lights display looks best when the yard lighting is balanced throughout the property and not on one side only or in one small area. Buy Christmas lights keeping in mind contrast between light and dark. Carefully light dark areas to focus on shapes and interesting forms like an evergreen tree, a wreath, or a doorway. Consideration of proportion is helpful when planning to buy Christmas lights. A large yard can easily handle large Christmas light displays including light strings with large C9 bulbs or a plethora of mini lights. A great way to add proportion and illusion in a holiday display is to light a large object while highlighting several smaller objects. Some large items to focus on are a house or a large evergreen tree. Pattern is important to keep in mind when setting out to buy Christmas lights. Light strings are easy to manipulate and hang in a pattern. A swirling pattern of light strings draped in trees looks particularly lovely during the holidays. Hanging tree lights can create a look of activity and excitement in anticipation of the season. A well thought out plan can create a beautiful festive holiday lights display and make a trip to the stores for Christmas lights more enjoyable when knowing exactly what to buy. Mini LED lights are energy efficient and a smart choice when replacing traditional incandescent mini lights. White mini LED lights give off a different color, however, and don’t mix well with white incandescent lights. Mini LED lights give off a cool bluish white tint while incandescent lights give off a warm yellowish white tint. To avoid replacing all lights at the same time, people try to mix mini LED lights with incandescent. This does not work well and should be avoided. Mini LED lights are a smart choice and should be used exclusively with other LED lighting. Festive lighting brings joy to many. Festive lighting inspires the soul and illuminates the Christmas spirit within one’s essence. Festive lighting is the beacon of peace within a crazy holiday time. Festive lighting gives a touch of holiday spirit to the dark winter nights. Festive lighting makes our holiday yards joyful, inspirational, peaceful, and spiritual.